Electronic Records Express is a free service and can be used to submit records for Social Security Disability Insurance (SSDI) claims as well as Supplemental Security Income (SSI) claims. 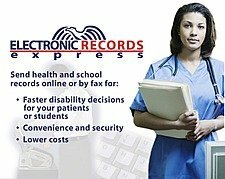 Electronic Records Express is a system that provides a way for medical providers and other organizations to send records electronically to the Social Security Administration and Disability Determination Services (DDS) for disability claims. When the DDS examiner receives a new application for disability, one of the first things that he/she does is contact all of the treatment sources listed on the disability application and requests medical records. Schools, hospitals, doctor’s offices, clinics, and other treatment sources can submit the requested records online at the Social Security’s secure website or by fax to DDS or Social Security. When records are sent using the Electronic Records Express system, they are automatically associated with the applicants’ disability claim file. 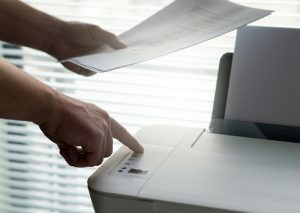 Sending records electronically is very convenient and can speed up the processing time of a disability claim. Anyone who provides health or school records to Social Security or DDS can use electronic records express including medical providers, schools, and attorneys or claim representatives. If you have been denied disability benefits, or if you have questions about applying for SSDI or SSI in the Southern California area, click here to contact an experienced disability law office in San Diego, Los Angeles or Riverside California.